Inner-City Arts is excited to welcome back Richard Cabral’s Fighting Shadows for a series of performances from October 18 to November 4. The Rosenthal Theater at Inner-City Arts and Lineage Entertainment Group in association with Jamie Gertz is proud to present this second run of Emmy-nominated and star of FX’s Mayans M.C. 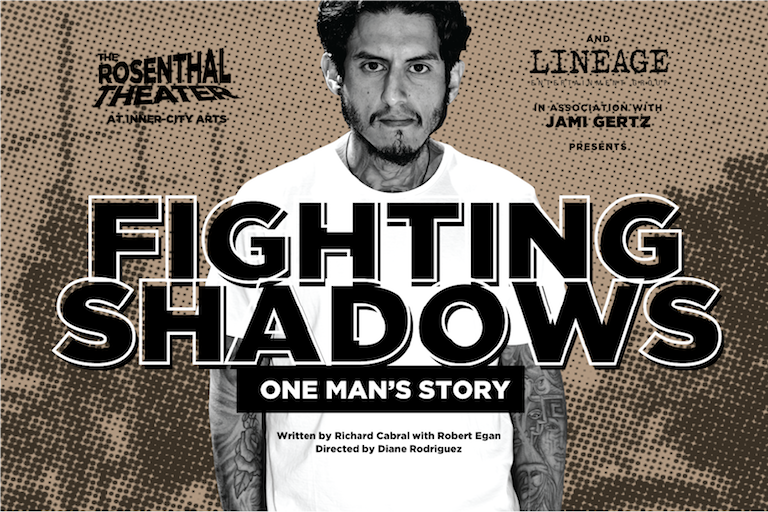 Richard Cabral’s Fighting Shadows, a passionate and poignant celebration of the power of human redemption and transformation against the shadows of gangs, prison, and violence. Fighting Shadows made its 2016 debut to critical acclaim and sold-out shows. Thanks to the generosity of The Sheri and Les Biller Family Foundation, this year, Fighting Shadows, directed by Diane Rodriguez, will feature an entirely new production. Fighting Shadows will also help launch The Rosenthal Theater’s 10-year anniversary while celebrating the spirit of Inner-City Arts’ mission to provide high quality arts education to underserved students through select performances presented to local high school classes at no cost, as well as partnering community organizations featuring a gallery installation and special pre- and post-show conversations with Richard Cabral. Prior to each show, audiences will engage in various art-making workshops, composing letters to currently incarcerated young people and adults. Set Design by: Efren Delgadillo Jr.
Special thanks to The Sheri and Les Biller Family Foundation.